The RSPCA is appealing for information after a cat was found in East Devon with it’s leg caught in an illegal gin trap. The animal’s injuries were so serious that it’s leg has been amputated. The use of the traps is being condemned as “barbaric”. The RSPCA was called on the weekend after the cat was found in a field near Ottery St Mary, with the trap still attached to it’s leg. 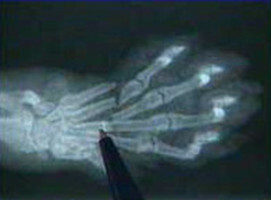 The x-rays show just how badly the cat was injured, the bones in the animal’s foot smashed by the jaws of the trap. In this case the injury has meant the cat having it’s leg amputated. It’s not known if the animal had an owner or who set the trap, but the RSPCA says it’s determined to find out.